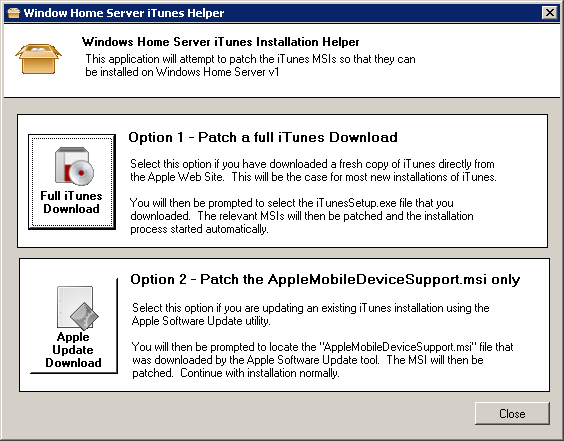 A minority of users have reported that iHomeServer occasionally fails to restart iTunes after a system reboot. This appears to be restricted to a subset of users who are running iTunes 10.6.x on a slow-ish server. The current version of iHomeServer (2.1.x) waits 2.5 minutes for iTunes to start up prior to giving up. This has been plenty of time in the past, however, the later version of iTunes starts up a bit more slowly so may affect a minority of users. Log onto the server hosting iHomeServer; Choose Start / Control Panel / Administrative Tools / Services. Find the 'bizmodeller iHomeServer (for iTunes)' service and right-click it, select 'Properties'. On the 'General' tab, find the 'Startup type' drop down box and select 'Automatic (Delayed Start)'; click 'OK' and close the Services window. Next time your reboot, iHomeServer should correctly restart iTunes. The next major release of iHomeServer is now in feature-freeze and available from our beta/pre-release download site. Please note it is still going through additional testing; there will be a few minor releases to it before it is promoted to the main download site. On the metadata editor page, you can click 'Internet Search' to autopopulate metadata fields / artwork based on results from these services. You can select a set of movies on either the Watch Folder view or iTunes View tab, right-click and select 'Auto-Tag'. iHomeServer will then get the best-matched data based on filename or embedded track name and set the metadata to the file with no further clicks from you. Finally, you can switch AutoTagging on automatically for a Watch Folder. Whenever iHomeserver detects a new movie has been added to a Watch Folder, you can configure Auto-Tagging to automatically best-match tag the movie with zero user involvement! "Interactive iTunes launch" - we have been promising this for a while, and this pre-release has the core functionality complete. 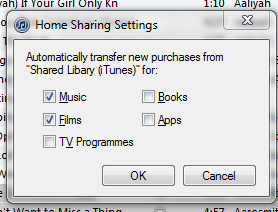 When you click the 'Start iTunes' button within iHomeServer Console, you are now given an option as to whether you want to start iTunes within iHomeServer or whether you want to start it interactively. If you choose the latter, iHomeServer will open the full-fat iTunes interface under the same user you have configured the service to run. 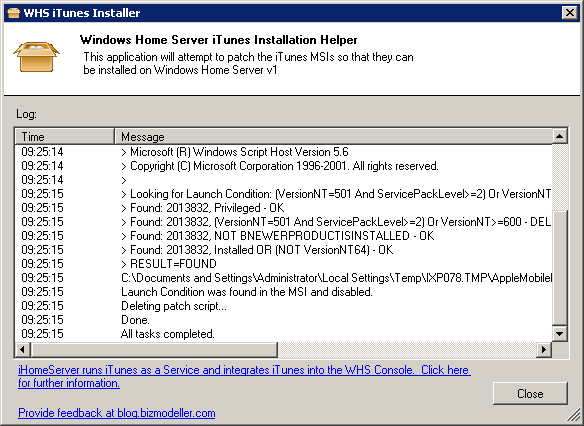 And best of all, it is run within the same RDP session as the WHS Dashboard/Console, therefore you will be running a remote instance of your server's iTunes GUI within your WHS Dashboard. 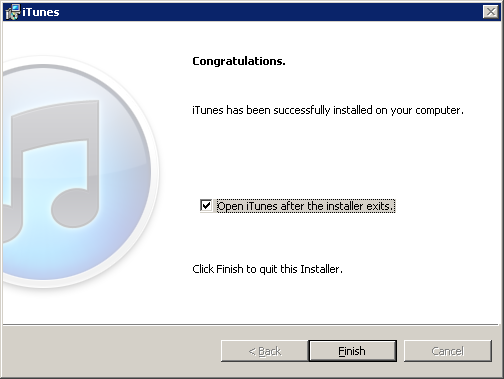 When you have finished making any changes to iTunes, you can close iTunes, click Start iTunes under iHomeServer control and iHomeServer will restart iTunes in the background. 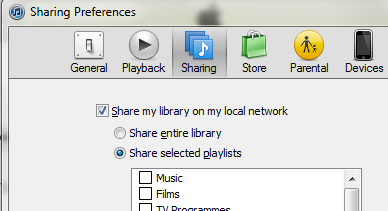 "Caching Playlists" - Caching Playlists has always been a bit slow; particularly for users with large libraries. On slow servers it could take 10-15 minutes. We have rewritten this process entirely and now analyse the iTunes Library.xml file for playlist/track information instead of querying iTunes. 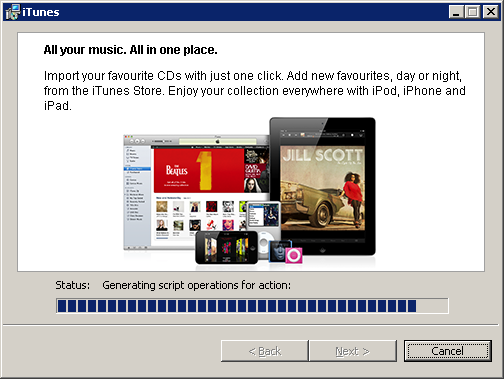 This has led to a massive performance boost when starting iTunes up under iHomeServer control. There's also quite a few stability improvements and general bug improvements - see the beta page for more information. We're also putting together on-line and in-app help; the beta includes about half of the documentation at the moment; this will be added to in future incremental updates. We are soon to be releasing an update to iHomeServer that will perform metadata queries direct from online metadata services. The feature will allow one click setting of episode / movie titles, descriptions, cover art, etc, so should save people lots of time and avoid the need for other tools in the rip-to-watch workflow. We currently have two services lined up - tagChimp and TheMovieDb.com. This post is really a request for feedback on whether iHomeServer users would like integration with any other Internet services? Did you know that pre-release versions of iHomeServer that include upcoming features that are still going through final testing are regularly available on our beta download page? These are available to any user who wishes to download them, although they are still subject to the same 30-day trial as the production iHomeServer release. 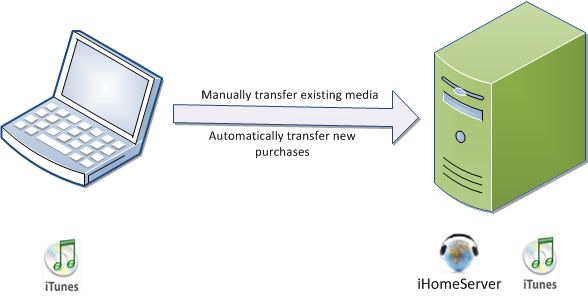 Importing of iTunes Media Library XML files from other instances of iTunes - automatic matching of data with your the instance of iTunes run by iHomeServer. iHomeServer will then update ratings, play counts, last play dates and playlist membership - this is a great easy way of copying other iTunes metadata across from a personal computer to your iTunes server without having to do a full iTunes folder migration. 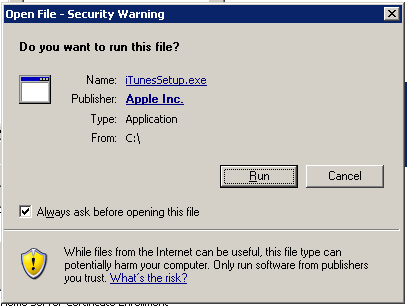 As with any pre-release software, please backup your iTunes library and media prior to installation just to be safe. It is important when upgrading any add-in on Windows Home Server v1 that you uninstall the previous version of the add-in before copying the updated add-in file to the server's add-in folder and installing any newer version. This is a long lamented and unfortunate design decision within WHSv1 which has fortunately been resolved in Windows Home Server 2011. We have had quite a few users recently who have been unable to get iHomeServer to index content on network drives or local DriveBender storage pools. 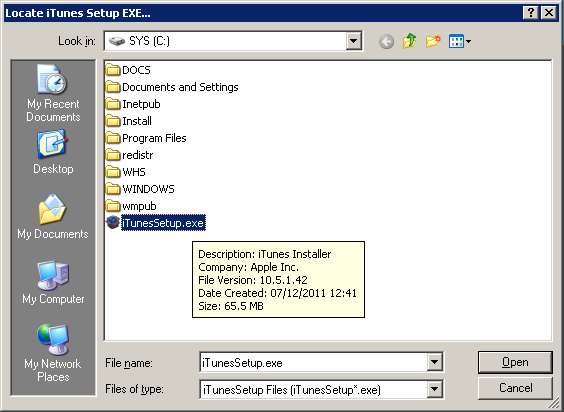 The symptoms of this are that you can add and view files in iTunes that are stored on a remote / network or DriveBender drive when you are running iTunes interactively, however, when you run iTunes via iHomeServer then you can no longer add new content and existing content may not be available within iTunes. Some users have also had problems seeing cover art and other metadata when they have pointed their iTunes to an iTunes library on a network drive. You may see these symptoms immediately, or after a reboot or even intermittedly. We posted a blog post a while ago about File Not Found errors similar issues and it is the same root cause problem here. Windows Services cannot reliably see mapped network drives. There are many Microsoft articles explaining why, but in essence, any network drive letter is tied to a Windows user session and is not guaranteed to be available to services which run in their own user sessions. As iHomeServer runs iTunes as a service, it cannot reliably see mapped network drives. The simplest way around this is to use fully qualified UNC file naming conventions when adding media to iTunes or when setting up Watched folders in iHomeServer. For example, instead of adding content from your f:\ (mapped to \\mynas\media), add it directly from the UNC path \\mynas\media. You can do this either with the server name or IP address (eg \\172.18.1.1\media). One point to note is authentication. You may have had to specify an account to access a network resource with when you set up your mapped network drive. When you use the UNC path, you cannot specify the user account to use. If your network resource (eg NAS or networked file share) requires authentication the easiest thing to do is to set up an account on the networked resource with the exact same username and password as the account you are using to run iHomeServer. Authentication will then be transparent and you can access your resources. Note that some of our users are using drive pooling software, such as DriveBender. Some of these packages (including Drive Bender) present the storage as a file share instead of a physical drive. Therefore users tend to map a drive letter to the local file share and access their DriveBender storage via what is effectively a mapped drive letter. Exactly the same problem occurs in this case - the mapped network drive is still not available to iHomeServer or iTunes. As above, the workaround here is to use the UNC path to your DriveBender shared folder (eg \\Server\DriveBenderMediaFolder) instead of using a mapped drive letter. Thanks particularly to one of our users, Jan, for helping get DriveBender working with iHomeServer. NB: iHomeServer Version 2 validates that the server can see the Watch Folder successfully before allowing you to add a new Watch Folder therefore this should be a lot clearer in this version! iHomeServer Version 2 - now with native Windows Home Server support - Sneak Preview! We are pleased to announce that that we are currently in final testing of iHomeServer v2 which is a major upgrade for the iHomeServer application. This will be a free upgrade for all existing registered users. 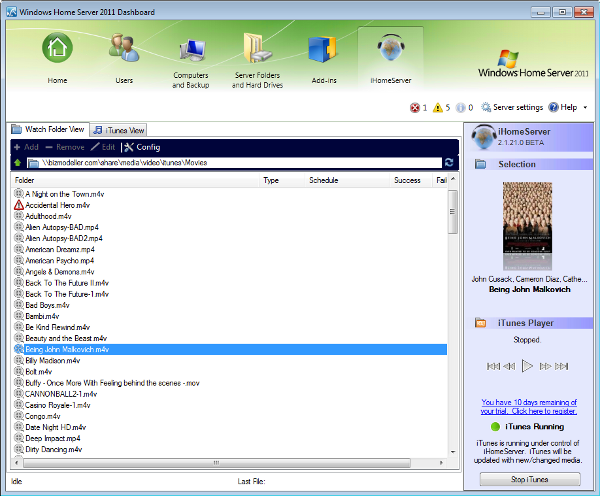 View your whole iTunes library and playlists directly within the Windows Home Server Console!